The Limoeiro Ni–Cu–(platinum-group elements (PGE)) deposit is a recent discovery associated with an igneous tubular conduit system in northeastern Brazil. Representative ores from the deposit have been used for platinum-group minerals (PGM) identification and for PGE in base metal sulfides (BMS) quantification. Ninety-eighty percent of the PGM in the massive sulfide ores is homogeneous Pt–Ni–Bi-bearing merenskyite (PdTe2) enclosed primarily by pyrrhotite, suggesting that it is formed by exsolution from monosulfide solid solution (MSS). Merenskyite gradually but systematically becomes poorer in Pt and Ni with increasing fractionation, which is interpreted to reflect a transition to a more evolved sulfide liquid that segregated in the eastern parts of the intrusion. In massive sulfide ores, merenskyite forms unusually large (up to 5000 μm2) euhedral grains, commonly in contact with spherical silicate inclusions. BMS hosts 12–16 % of the Pd, with the remainder hosted by PGM, which is interpreted to indicate that merenskyite recrystallized from a PGE-bearing bismuthotelluride metamorphic melt formed during high-grade metamorphism. Sperrylite (PtAs2) is the second most abundant PGM (18 % of PGM in disseminated ore) and in contrast to merenskyite occurs mainly as very small (median of 25 μm2) inclusions in high-temperature silicates and oxides, interpreted to have crystallized at high temperatures directly from sulfide blebs that formed and were transported within the Limoeiro magma conduit. The online version of this article (doi: 10.1007/s00126-015-0585-0) contains supplementary material, which is available to authorized users. We would like to thank the technical support from the Limoeiro Project team (headed by Rafael Freitas) for their assistance and cooperation. We are grateful to Jones Belther (Votorantim Metals’ Minerals Exploration Division director) for permission to sample the Limoeiro deposit and publish the results. We are immensely glad with the very detailed corrections and suggestion of improvement carried out by the Associate Editor Mike Lesher, Editor-in-Chief Georges Beaudoin, Reviewer Belinda Godel, and an Anonymous Reviewer. 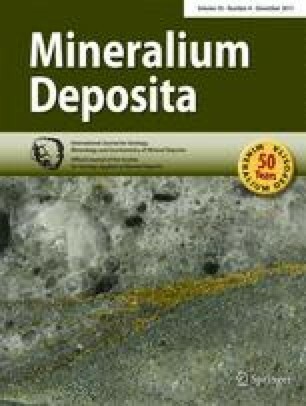 This paper is part of first author’s PhD thesis (Geosciences Institute, University of Brasilia), which was partly funded by CAPES Foundation, Ministry of Education of Brazil, fellowship (process BEX 3603/13-0). This study was funded by CAPES Foundation, Ministry of Education of Brazil, fellowship (process BEX 3603/13-0). The authors declare that they have no conflict of interest.